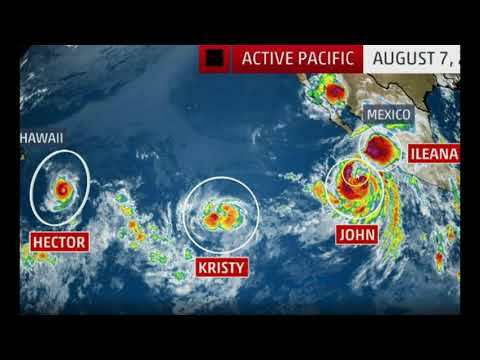 Following weeks of below-average tropical activity in the eastern Pacific Ocean basin, Mother Nature has decided to add several tropical cyclones into the mix. Hurricane Hector, the first to form, is expected to pass south of Hawaii Wednesday. Over 1,400 miles east of Hector was Kristy, which had strengthened quickly into a tropical storm by Tuesday morning. About 1,000 miles east of Kristy and closer to Mexico’s Pacific Coast early Tuesday morning were Hurricane John and Tropical Storm Ileana. Ileana didn’t stick around long, dissipating late Tuesday morning after John’s nearby dominant and larger circulation caused it to fall apart. The remnants of Ileana are forecast to pivot north and northwest around John and become less defined. You can see all four of these tropical cyclones lined up in this satellite image from Tuesday morning.